I have a confession to make: I am a Frigophobic. It’s not often that I would volunteer to be cold. In fact, I detest the cold so much that I begin dreading the wintertime long before summer is even over. Once the thermometer drops below 60, my body goes into a state of permanent shivers, and throughout the always-punishing winter, I search for ways to warm my bones, like submerging my body in a hot bathtub, downing steaming hot mugs of coffee or tea, or hiding under a layer of blankets until the arrival of summer. So why in the world would I willingly enter a freezing cold chamber – one that is colder than the lowest natural temperature ever recorded on this planet – that boasts temperatures of minus 250 degrees Fahrenheit? For one, I was curious. For another, I was away at a spa, and when I go to spas, I always welcome the opportunity to try new things. All geared up for cryo! I also was lucky to be at the spa with a few other journalists; new friends who supported me through my experience. “I’ll do it if you do it,” was all I needed to say to get them to line up and play cheerleader while they let me play (a freezing) guinea pig. Cryotherapy is an intense form of cold therapy and procedure I knew very little about. My limited knowledge of it was that it is used by professional athletes to ease pain and muscle stiffness, much the same way ice would be applied to an injury to help reduce swelling and improve blood flow. Cryotherapy is a whole-body treatment. Rather than applying an icepack or sitting in a tub of ice or freezing water (unthinkable! ), you stand upright in a chamber (from which your head peeks out) that gets its very cold temperature from compressed gas (nitrous oxide) stored under high pressure. Some other reported benefits of Cryotherapy: better sleep, faster metabolism (which can fuel weight loss), relief from anxiety, depression, fatigue, jet lag and migraines, and improved skin tone and energy. Turnberry Isle in Miami – which was just named the #2 resort in Florida by the readers of Conde Nast Traveler – was the scene of my experience with cryotherapy, or cryo for short. Their ame Spa & Wellness Collective, in addition to offering a host of other treatments, is housed in a beautiful three-story, 25,000 square foot sunlit building where you can also find other goodies like massages and facials, hydrotherapy, a Himalayan Salt and Infrared Sauna Chamber, medical and fitness offices and a dizzying array of classes including Zumba, spin, pilates and yoga. 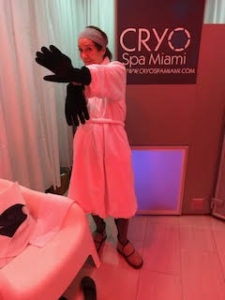 Dr. Turovsky explained that my session would last just two minutes, and that the booties and gloves they supplied would assure my extremities would not get frost-bitten. (I wore my own sports bra and bottoms, and removed all my jewelry.) Usually done in a series of about three-minute sessions (five to ten are suggested to see full results), this one would just be a “tease” and give me an idea of how it felt to face sub-Arctic temps. It was time. All geared up, I tentatively stepped into the chamber, feeling nervous but then empowered, peered outside at my friends who gathered around, rapt and curious. A blast of air surrounded my body, but it didn’t make me shiver; instead, as I spun around like a whirling dervish (freezing cold temps make you do strange things), I felt surprisingly calm but energized. The only place where I really felt a bit uncomfortable was on the outside of my knees – where there is very little fat, explained Dr. Turovsky, later. Outside cheers – “30 seconds down! C’mon, you can do it!” egged me on. When it was time to exit the chamber, I was smiling; feeling accomplished and happy as I wrapped myself in a plush robe and continued to move my body, as instructed. I wasn’t numb; I wasn’t cold. Instead I was energized; buzzing. Was it the real physical effects of the cryotherapy? Or was it the rush of satisfaction I got from facing my fears and challenging myself? Perhaps it was a combination of all three or merely a placebo effect; my mind telling me that it worked. No matter. All three have merit, and whichever it was, I’ll take it. And I conquered a phobia, to boot. Maybe that will help me get through the impending winter season. So interesting! Happy birthday, too, Sheryl. Thanks, Nancy; it definitely was interesting AND fun! 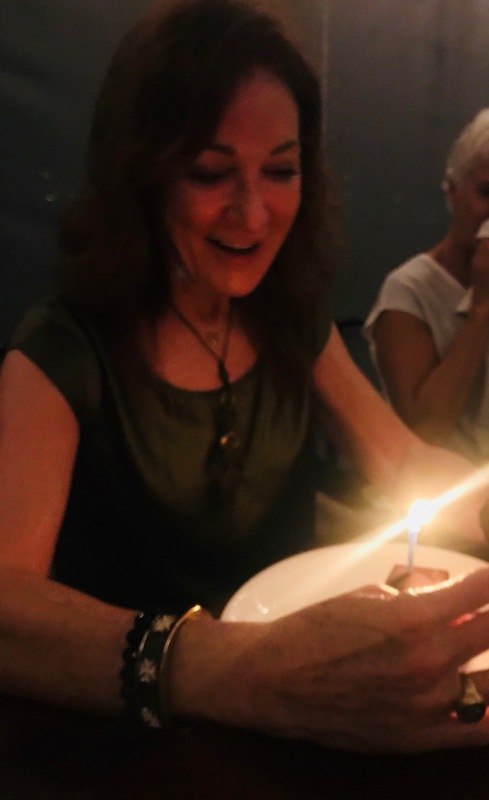 Happy, happy birthday—hope the year is full of wonderful celebrations! Thanks to your writeup, I am very tempted to give this a try. Thank you for sharing!